With diets for women like the low fat milk diet drinking milk has never felt so good knowing you are doing your body some good getting on top of weight loss. 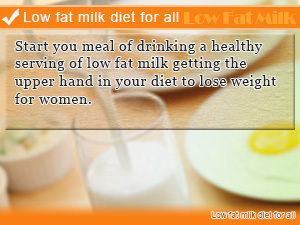 Low fat milk makes an excellent addition to your diet plan to lose weight. Like other single food diet plans, it is easy to get started requiring less commitment and momenta push, which is why it considered one of the favored weight loss diets for women. Can I lose weight drinking low fat milk? There is good news for people who have been in the gym training but worry no matter how much you do you are not getting any lighter by the day. Although you may be set on trying to squeeze out weight loss in the gym, you would be surprised to find out that all it takes is drinking low fat milk. How to lose weight on low fat milk is easier than you think. Weight loss for women doesn't get as easy as this. The Low Fat Milk Diet is one of the easiest food diets out there. So throw in the towel in worrying about your weight relaxing with a cold glass of low fat milk. In this daily take on Slism, we introduce the low fat milk diet to give you more option in losing weight going into detail on how easy it is to start while discussing some benefits you get from drinking milk finishing with some workarounds to help you if your get stuck. Milk and building up your muscles? The main reason why it is hard for women to burn fat has to do with muscle mass. If you've ever going on a diet, you know how important building lean muscle is to burning fat especially if all you are looking to do is slim down. The formula to success in weight loss is diet and exercise. The rules for making your low fat milk diet work out are so easy! All you've got to do is drink 1 cup of low fat milk before a meal. That's it!? Luckily yes, on top of drinking a cup of low fat before starting to eat a meal, there are no other rules. Just eat the way you are used to while keeping nutritional balance in mind. As a child you may have memories of drinking a lot of milk. More milk than you drink even now as a full grown adult. It is not common to be told to drink like you are chewing. That means take your time. By drinking as if you are chewing your food so to speak, this in fact comes with many great benefits in your diet such as appetite suppression. Taking your time as you drink a glass of low fat milk gives your body more time to adjust to consumption, making a big difference in your appetite. At first glance it may be hard to see how milk and your muscles are tied together. In school you learned that milk helps you build strong bones. What about muscle? To understand more on what drinking milk does for your muscle, we need to take a look at how your muscles are affected by milk first. As it may seem, no matter how you look at it nothing gives you clues. Don't let that bother you. There is no point worrying over spilt milk. The fact that the sheer details of the low fat milk diet is what makes it so thought provoking and asking for credibility. 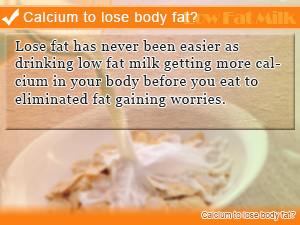 The low fat milk diet is built around getting more calcium in your diet. By drinking milk you increase the amount of calcium in your blood stream carried out by nutrient transport. As the concentration of calcium in your blood so does the benefits you get in your diet from drinking milk. What do you think are the positive effect that high calcium concentration in the blood has on your body? The answer is that the parathyroid hormone made up of many components plays and active role in your fat burning metabolism. This hormone decreases the amount of calcium absorbed by fat cells, inhibiting the production of fat while promoting healthy breakdown of fat. In addition to being a good source of protein and fats in your diet, where you get the most benefit is stability. When your body runs out of energy or nutrients for that matter it goes into what is called survival mode. Drinking milk help keep you out of survival mode providing stability in your diet. In 246g (8 oz) there are 114 calories in low fat milk with 7.9g of protein (31.6Cal), 2.08g of fat (18.72Cal), and 11.44g of carbohydrates (45.76Cal). Low fat milk is high in calcium and vitamin B2. The calories in 8 ounces of low fat milk can be burned in 11 minutes of jumping rope or half an hour of vacuuming. The scariest thought about dieting that after going through all the trouble it takes to lose weight to put the weight back on again. This is common in some single food diet plans and restrictively low calorie diets that offer little when it comes to nutrition. On the other hand, the low fat milk diet help you drop body fat having a waist slimming effect and is less likely to result in unwanted weight rebounding after diet due to the fact that you will be exercising to increase lean muscle mass. The key to losing weight is to always keep your metabolism in mind in the process. Building a strong metabolism give you stability even after you reach your diet goals. When you do don't stop because that's when the real fight starts. The low fat milk diet may not be the best way start dieting if you are lactose intolerant. You may not be able to drink milk the same way non-lactose intolerant people are used to, but don't let that stop you from feeling like it. The soy milk diet is a great alternative to the low fat milk diet. For people with low amount of lactase, the enzyme used by your digestive system to break down milk sugars, lactose, hot milk may be the next best bet in making the low fat milk diet work for you. Hot milk is easy to drink than cold milk if you are lactose intolerant. Another well-known technique used for lactose intolerant people who want to drink milk is to spread the amount you drink over a longer period of time. Getting used to the taste of milk this way is said to improve you tolerance of milk lactose. Let's face it not everyone is willing to take the bull by the horns this way. If you fit this category, then you will be happy to find out that there are lactose free alternative even in milk to choose from. For people who can't drink milk plain no matter what because of the smell it gives off, adding cocoa, green tea, or even coffee to milk may get rid of the smell standing out in milk making it undrinkable. In addition, milk can be added to your diet via cooking or when having a snack such as milk and cookies. The facts stand that there are people that just can't drink plain milk. Figure out what it takes and implement. Is overeating making you feel guilty after every meal? Drinking soy milk before meals can tie down your appetite so you don’t have to. Get control back from your body with the power of soy. Start you meal of drinking a healthy serving of low fat milk getting the upper hand in your diet to lose weight for women. Calcium to lose body fat? Lose fat has never been easier as drinking low fat milk getting more calcium in your body before you eat to eliminated fat gaining worries. Lactose intolerant? There is still hope. 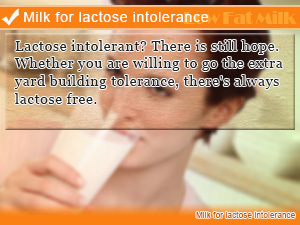 Whether you are willing to go the extra yard building tolerance, there's always lactose free.